My family had a big, warm, dry weekend down in San Antonio, Texas for my sister’s wedding. Meanwhile, in our hometown of Sanford, North Carolina, this guy was having an even better time riding out Hurricane Matthew in the streets on a jet ski. I came across the video uploaded to Facebook by Tamera Brady (who I don’t personally know) by one of my friends who was stuck at home all weekend due to the extreme flooding brought on by Hurricane Matthew. The guy is jet skiing in the parking lot of the Riverbirch Shopping Center, just five minutes from where I used to live. I used to ride my bike there. It would have been way more exciting to take a jet ski instead. Of course the flooding caused an unbelievable amount of damage to the area, with my old neighborhood having trees falling on houses and extreme water damage. Luckily all of my friends and relatives in the area are safe, but there are so far 11 reported deaths in North Carolina alone. 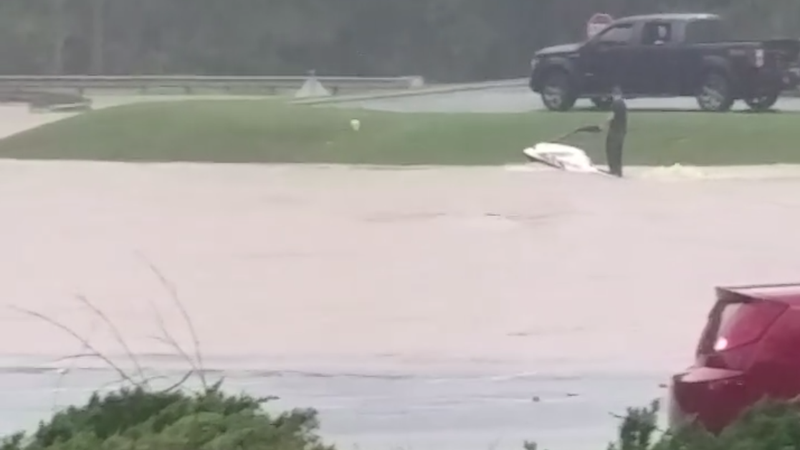 I’m not suggesting anyone should take a jet ski through a flooded street, but if the roads are gushing with a river of water and the power at home is out, it’s easy to see where this guy got the idea. And if they didn’t want people jet skiing there, why would they call it Riverbirch?